NOTE: Click on the various photos for enlarged images. 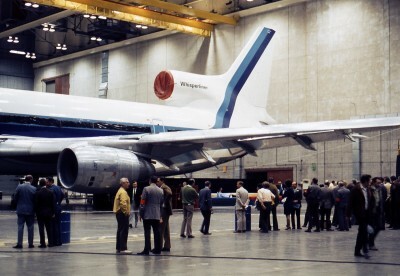 As mentioned in the previous chapter, the Chicago DCS base was opened in anticipation of L-1011 TriStar service, which was to be initially flown exclusively by ORD cabin and cockpit crews. 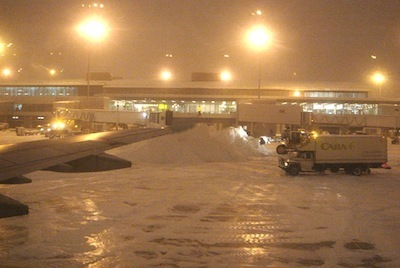 The entire airport staff at Chicago was closely knit, a refreshing change from New York. The cabin crews were generally younger and full of enthusiasm, and we enjoyed working with the ticket and ramp agents. Another bonus was the considerably lower cost of living. Bruce Megenhardt and I were the first to “officially” transfer to O’Hare from New York, and joined the five already there on an ad hoc basis. 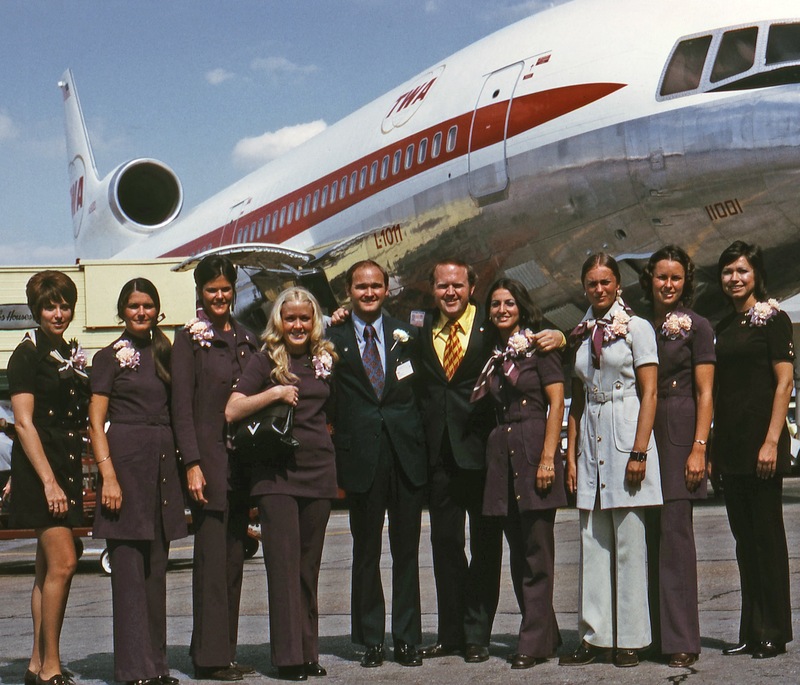 Initially we worked the few 747 trips staffed with ORD flight attendants, 2-day pairings to Los Angeles and San Francisco plus a Las Vegas turnaround. The Vegas trip, naturally assigned Flight Number 711, departed in the morning with the same airplane returning as Flight 780 after a 90-minute turnaround. 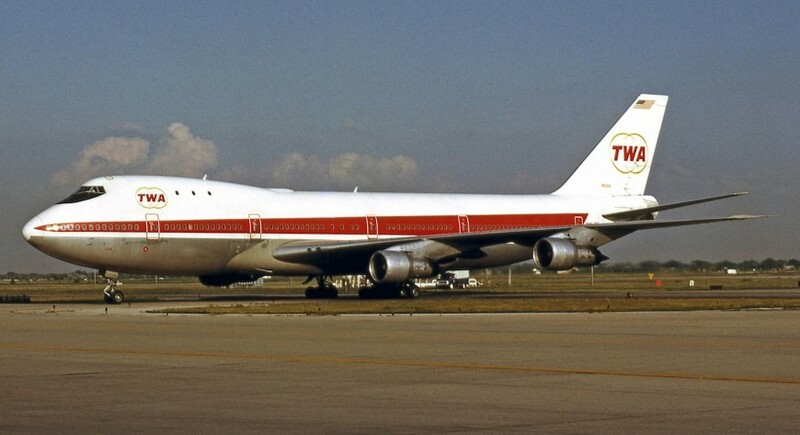 It carried heavy loads and was a big moneymaker for TWA, even on this relatively short hop for a 747. 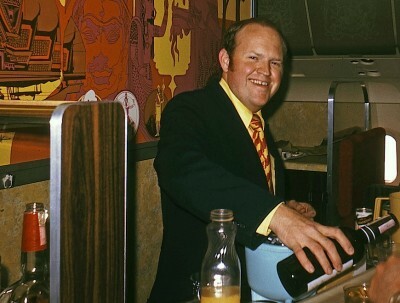 We still had coach lounges on the jumbos and two flight attendants were assigned duty behind the stand-up bar. I vividly recall resulting $300 liquor receipts from the bar alone, and this was when drinks were a dollar and beer was 50 cents! The 747 coach lounge, a liquor sales gold mine on the way to Las Vegas. While still based back in New York, I was tasked to complete some liaison work with our corporate office staff in preparation for the L-1011 service introduction. This temporary duty was probably the result of my TriStar planning participation prior to leaving for Pan Am. As a result, I drew some plum assignments including participation in evacuation tests at the Palmdale plant. Several cabin crews were assembled for the drills, from both Eastern and TWA. I was along as a supervisor and observer as the tests required that line flight attendants complete the actual evacuations. I did, however, get to go through all the preliminary training and jumped down the escape slide a few times, becoming “qualified” to later work a flight. Successful completion of the test required evacuation of the maximum passenger capacity of the airplane in 90 seconds using half the emergency exit doors. The airplane was placed in a darkened hangar, with the crewmembers unaware of which exits would not be operational. 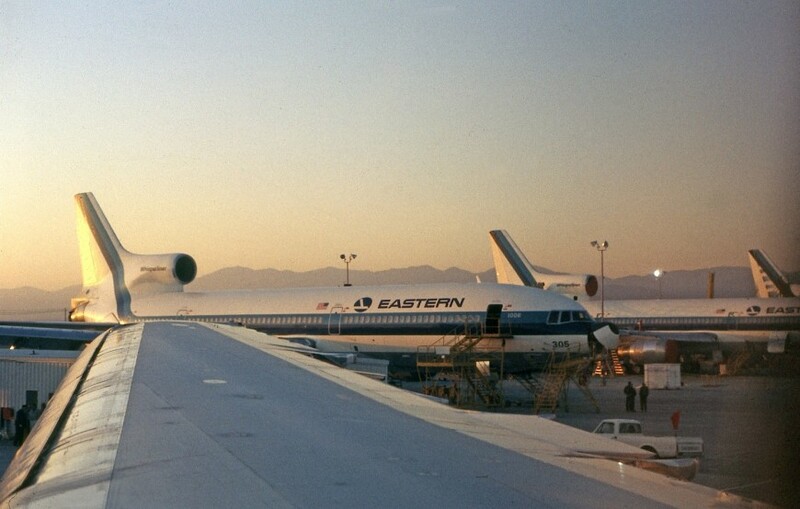 One of Eastern’s TriStars was parked in a hangar with its windows taped over. A covered walkway brought the “passengers” on board without seeing the airplane’s exterior or giving an idea which doors had been disabled. Movie and still cameras had been set up to record the entire event. On the first try, the time limit was exceeded by only a few seconds, which required another attempt, hence the need for multiple crews being available. On the second try everyone was evacuated well ahead of the deadline and the airplane was then certified in that category. 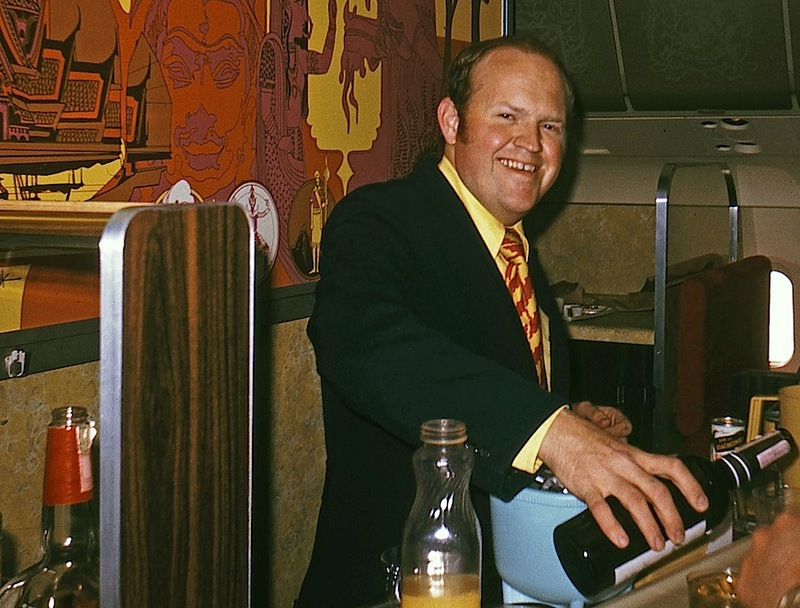 We served breakfast to the Lockheed folks and later opened the fully stocked coach lounge bar, receiving thanks from our “passengers.” Several commented that they were on the delivery of Eastern’s first TriStar as well, and received only box meals and no adult beverages. A low pass was completed over the downtown airport at Kansas City (MKC), still in use while awaiting opening of the new facilities at Mid-Continent Airport (MCI). 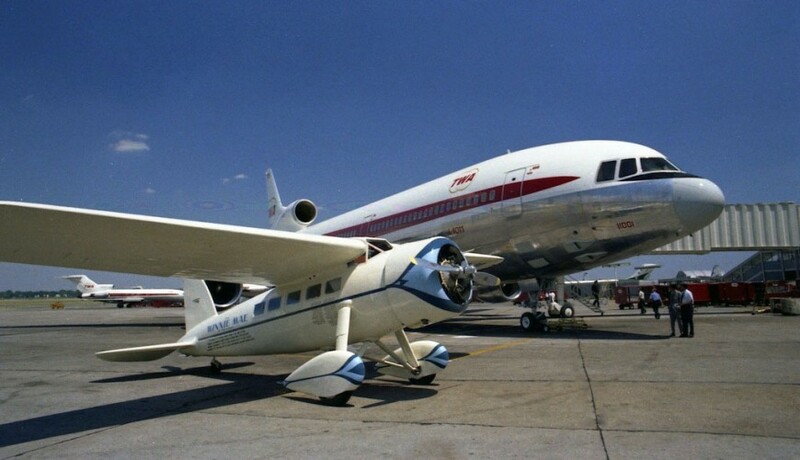 We then landed at MCI, dropped off our Lockheed friends, and headed for Indianapolis to pick up a small cargo package and operate the first revenue flight from that city, a formality that allowed TWA to avoid paying sales tax on the airplane purchase. As the only DCS qualified on the L-1011, I drew another fun task, working four scenic flights out of Las Vegas on June 4, introducing nearly 400 invited guests to the TriStar, including travel agents, corporate account holders and other VIPs. Among the passengers were TWA executives, including President F.C. “Bud” Wiser. Crew on the Las Vegas scenic flights: Lynn Abramson, Joyce Tomazin, Julie Woodburn, Carmella Dean, Sally Bartu, Pat Canson, Addie Collins, me and Joan Millisack. That’s Captain Ed Frankum in the cockpit window. Taken during one of the Las Vegas scenic flights, this picture was published in Aviation Week & Space Technology. Somehow I always seem to appear behind the bar, this time with a pretty girl, Joan Millisack. 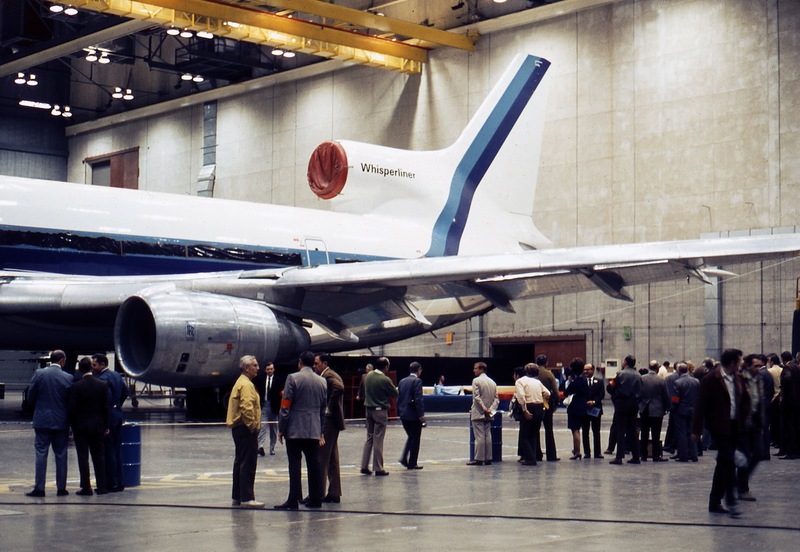 Regularly scheduled service began on June 25 with the L-1011 replacing a Boeing 707 on Flight 177 from St Louis to Los Angeles. A day later, roundtrip LAX-STL-LAX service began. Of course this was a logical pattern for LAX-based cabin crews, but all those trained on the airplane were based at O’Hare. So, for the first few weeks, we deadheaded between ORD and STL in order to fly these trips. I was one of three DCSs assigned to the inaugural. Svein Husevold and I provided on-board training while Hank Krueger served as the working DCS. Then for the next three days, Svein and I continued training crews, certifying both the flight attendants and DCSs, who needed one flight with a qualified supervisor/instructor. Although a bit challenging, it was fun to watch our cabin crews get the hang of a new airplane. After a few days off, I came back for five more days of back and forth, until we had a sufficient cadre of qualified people. 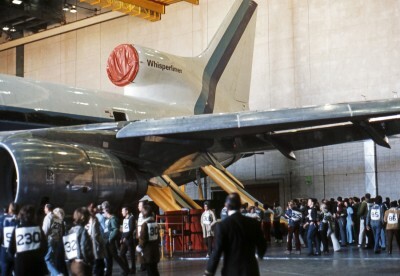 The TriStar contained many new features. Probably the most unique was its lower-deck galley, or as we liked to call it, “the belly deli,” accessed by two lifts from the main deck. 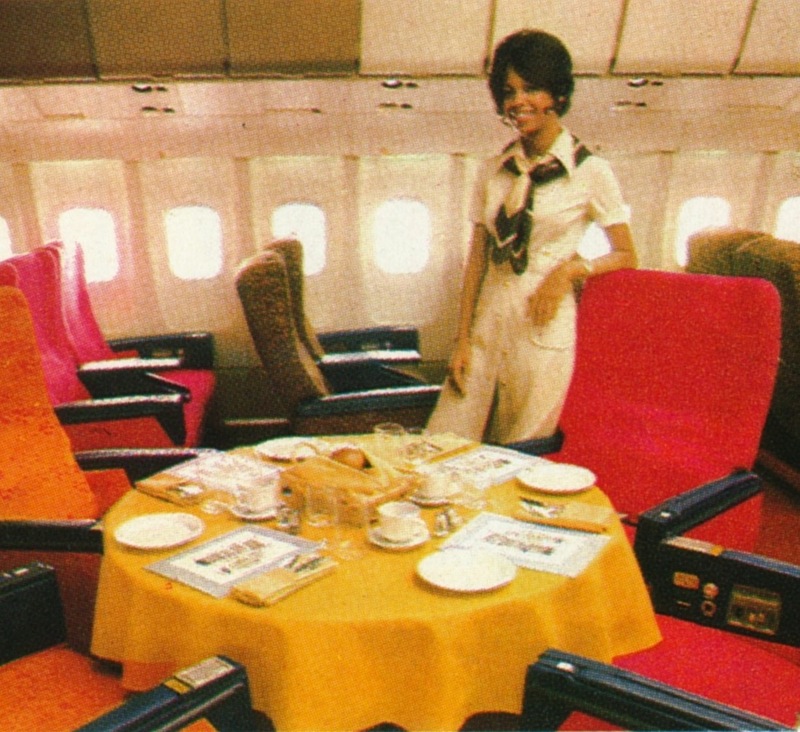 Similar to the DC-10 layout, it was designed to “take the kitchen out of the living room,” and provide more passenger capacity. Meals were cooked below, loaded into carts and sent upstairs. 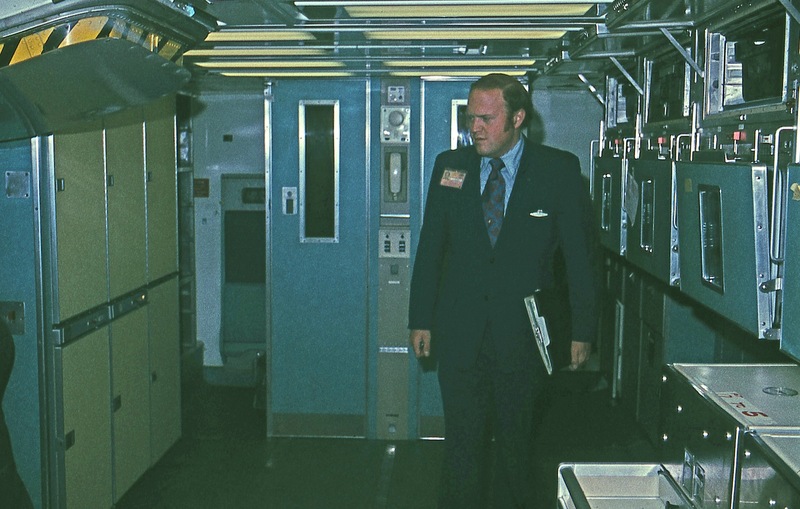 Each cart was placed in a service center or locked in position on “mushroom” floor fittings by the doors. Power cords were attached to keep meal entrees hot until served. Beverage carts were also boarded downstairs. Initially, it was policy to keep the aisles clear by stationing the carts in service centers. Orders were taken for the cocktail service and brought out to the customers, as were the meals. We offered a choice of three entrees, in coach! It’s hard to believe a service like this could be completed, but we had eight flight attendants on the TriStar, and sometimes nine; they got it done. One reason for keeping carts out of the aisles was the fact that they were wide, restricting passengers from passing around them and all five coach lavatories were located at the back of the airplane, in an arrangement that became known as “cannery row.” The carts were also heavy, and a bit of a task to push forward against the L-1011’s 3° up angle during cruise. The 30-seat first class cabin had a small, 4-seat lounge. Center cabin seats swiveled, allowing clusters of four to face a dining table. Folding tops were fitted atop a raised smaller table, which was pulled upwards to form the table base. Initially the tops forced the tables underneath to collapse under the weight, dumping food and beverages all over the customers. A prompt maintenance fix allowed us to resume using this popular layout. A stock photo taken during one of the scenic flights. That’s me sitting in the background, and Flight Attendant Pat Canson on the left. Lynn Abramson is behind the bar. Dining in first class was elegantly served in the center row on table tops set up between four seats. Everyone liked this feature once the tables quit collapsing. The L-1011 was TWA’s first airplane with a factory-equipped coach lounge, which could accommodate eight passengers for takeoff and landing, plus two side-facing seats, although lounge seats were not offered for sale. The 176-seat coach section was divided into three cabins, with 40 seats each in the forward and aft cabins, and 96 in the center cabin. Eight-abreast seating allowed wider seats than those on the narrowbody aircraft, a welcome enhancement. Author Doug Ingells traveled with us while preparing his book, “L-1011 TriStar and The Lockheed Story.” Here’s the crew that hosted Doug roundtrip between Chicago and Los Angeles: Standing: Sally Steinhardt, Lois Young, Captain Thad May, Sandi Gomez, F/O Doug Westland, Cheryl Byron and F/E Gene Bridges. Seated: De Pilgrim, Sandy Phillips, Sharon Hurley, Marci Kaczenski, Sherry Gutzler and me. A staged picture from Doug’s book. Rheostat switches allowed gradual cabin dimming and lighting, a nice feature. And for the first time, Fasten Seat Belt and No Smoking signs cycled on and off when first activated. Perhaps the biggest downside to this new airplane was the lack of centerline overhead storage bins, and outboard bins that were not large enough to accommodate a briefcase without forcing it upwards when closing the bin door. In turn, this provided quite a surprise when an unsuspecting passenger opened it later and wound up with a face-full of luggage. Lockheed’s designers justified this design by pointing out that a middle shelf in the bins folded back to accommodate a hat box. Of course hat boxes were far outnumbered by briefcases. 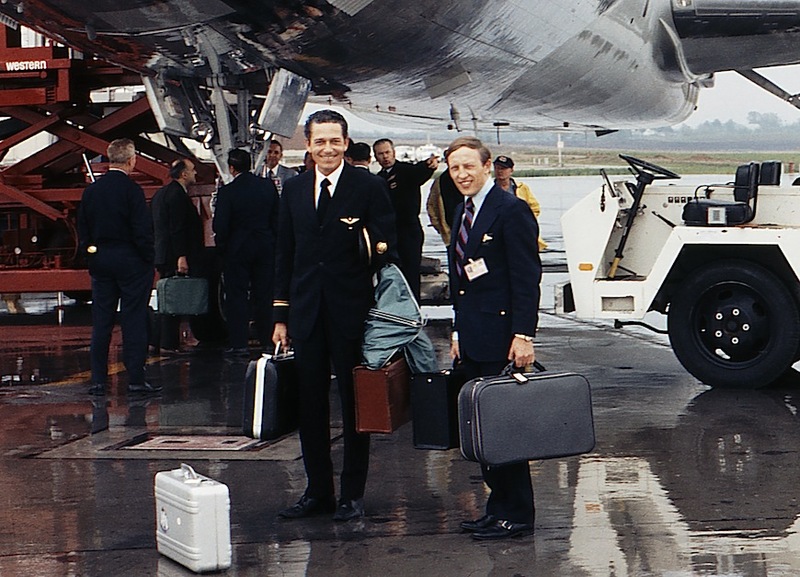 Lack of centerline bins did give the cabin a much more open look, and three waist-high carry-on luggage compartments were provided, which helped, but compared with our 747s, overall storage space was minimal at best. 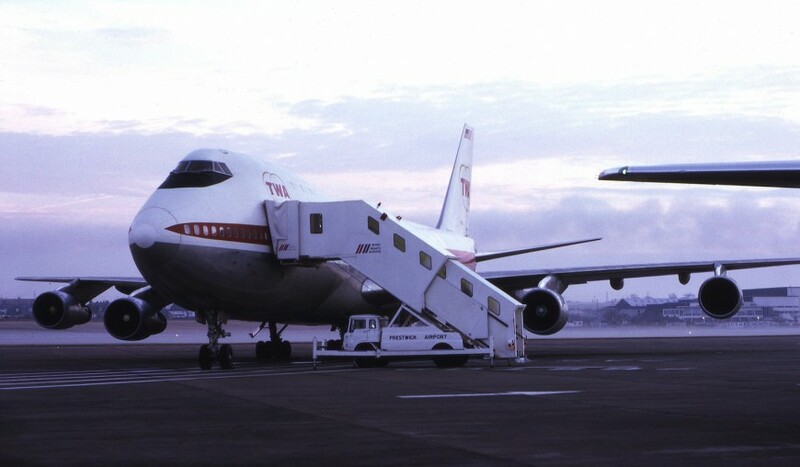 The TriStar’s biggest advantage was its Category III-a landing system, allowing operations with as little as 700 feet of forward visibility. Pilots loved the airplane, as did the cabin crews. In July, we received the second L-1011, allowing start-up of service between Chicago and Los Angeles. This created a nice 4-day flying pattern without deadheading. We operated to LAX, had a day off, then flew a LAX-STL-LAX turnaround on Day 3 before returning to Chicago on the fourth day. As more TriStars were delivered LAX cabin teams began taking over some of the flying but most of it was still carried out by ORD-based crews. Once L-1011 service implementation was complete, and our schedules were less intense, Bruce and I decided to stage a big housewarming party to celebrate our move into a 2-bedroom apartment in suburban Schaumburg. To make it unique, Coors beer would be provided in abundance. At the time, Coors was not sold east of Denver, so how to import the popular brand? Bruce and I noticed that cases of Coors were often brought back by crewmembers on the 747 Las Vegas turnaround. Discount prices were available from a distributor near the airport. So we hatched a plan to transport a sufficient supply for our party. The dastardly deed would be accomplished on June 22, when I was scheduled to work Flight 711/780. The only reason I am certain of the date is because of the events that took place on that trip, which were noted in my logbooks. All went well on Flight 711. As soon as the last passengers deplaned at Las Vegas, a flight attendant and I borrowed a pickup truck from one of the rampers and made our Coors run, returning from the distributor with something like 10 cases, which were easily stowed in the cavernous confines of the 747 passenger cabin, under the last rows in each section and in coat closets. 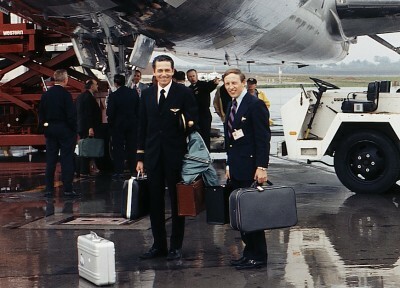 Each case was assigned to a flight attendant for safe keeping, with the promise of an invite to the housewarming party. 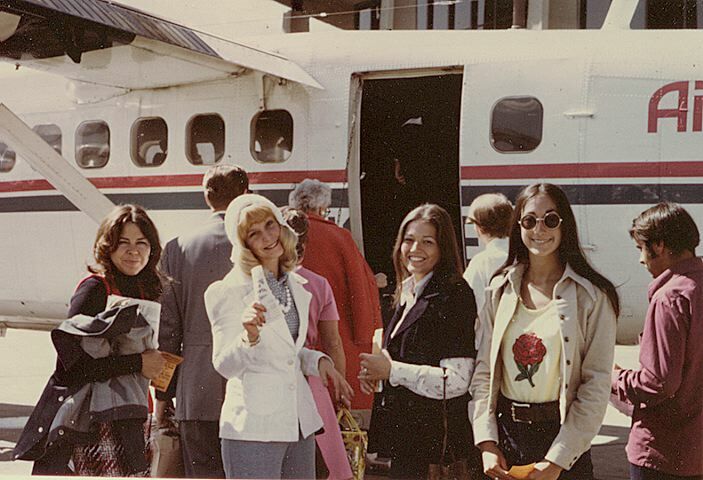 Such fraternization between DCSs and flight attendants was, of course, frowned upon, but there were plenty of volunteers. Everyone remained calm; we were only in the air a total of 13 minutes, rolling out on the runway with emergency vehicles standing by. There was no fire and the 747 came to a halt at the same gate we had departed from. I looked out a window on the right side and saw one of the maintenance foremen looking inside the tailpipe of the outboard, No. 4 engine, shaking his head. This flight was toast. We had additional flights from Las Vegas and Chicago that afternoon, but this was the only 747 trip, and the ground staff immediately began scrambling to protect the 216 passengers on alternate schedules, those of both TWA and United. The pilots would stay with the airplane. Meanwhile, disposition of the cabin crew was at the bottom of everyone’s priority list. For the moment 10 cases of Coors remained in place on the wounded airplane. I don’t remember exactly how long it took for the planning department to come up with a way home for us but it was at least a few hours. Finally, we were set up to deadhead back via San Francisco, on a 727 to the Bay City, then the overnight 747 to O’Hare. 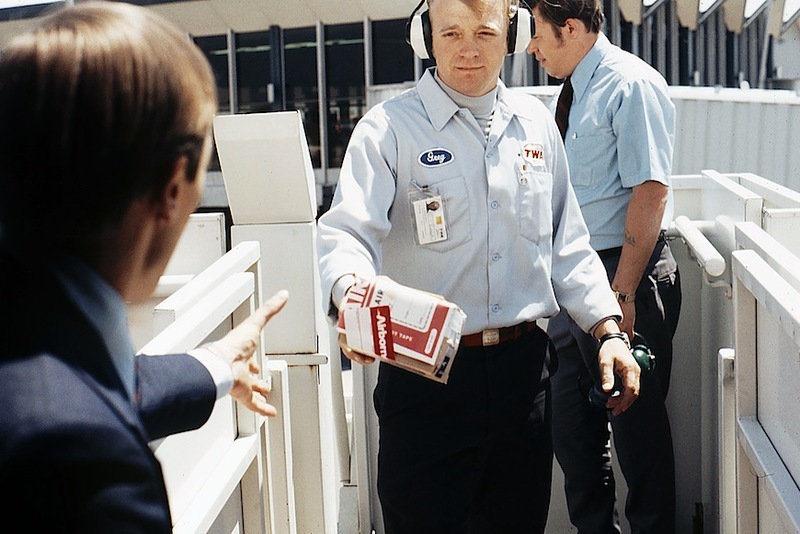 With no enclosed overhead bins and limited closet space on the 727, we were helped out by the ramp service fellows (no female rampers back then), who stashed the Coors away in the belly cargo bin. Fortunately the cabin crewmembers had only brought tote bags with them for the planned turnaround trip, so were able to cart the beer around. It was comforting to know that would have plenty of storage space on the 747 for the final leg. There was plenty of time to retrieve our contraband at San Francisco and retire to the crew lounge while awaiting Red-Eye Flight 130, the midnight departure that would take us home. Until now, no one had stopped to think that our 747 sitting broken at Las Vegas, after its scheduled arrival at Chicago was to have completed Flight 771, a dinnertime nonstop from ORD to SFO, then, you guessed it, Flight 130 back to O’Hare. Imagine our shock, as we approached the departure gate and saw the replacement airplane: a Convair 880. As mentioned in earlier chapters, the 880 was a great airplane, but to say storage space in the cabin was minimal would be an understatement. SFO-based DCS Tom Fitzgerald was working Flight 130 and almost fell over in laughter as I explained our predicament. With his help, friendly ramp agents were cajoled into stowing our brew below. Meanwhile, one of the flight attendants made a covert call to a ramper at O’Hare, probably a boyfriend, soliciting assistance on arrival. By the time we lifted off at San Francisco, everyone on the crew was exhausted and slept for most of the flight, although I was a bit apprehensive about all this Coors beer being dragged by flight attendants and me to the crew bus at O’Hare, for transport to the employee parking lot and off the property. 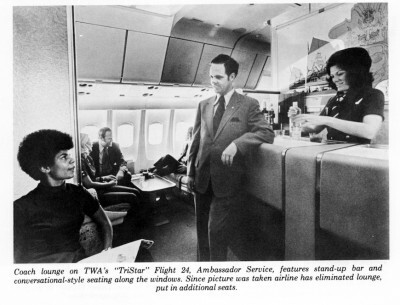 The thought of being sighted by certain members of TWA In-Flight Service management was definitely cause for concern. In retrospect, I should not have worried. As we climbed down the exterior Jetways steps back home, our loot was being transferred from the cargo hold to a ramp vehicle, which was then driven directly to the employee parking lot and into the trunk of my car; no one was the wiser. Being barely 5:30 in the morning also helped cover up the crime. By the time it was over, I think we were down two cases of beer, or perhaps three, owing to “gratuities” for help along the way. The hit of the party was one of our apartment bathtubs, filled with ice and “Colorado Kool-Aid,” all of which was consumed. A good time was had by all, thanks in great measure to the Coors Caper. As more TriStars came on line, the type replaced all of the ORD 747 flights except the London nonstop, flown at the time by JFK crews. 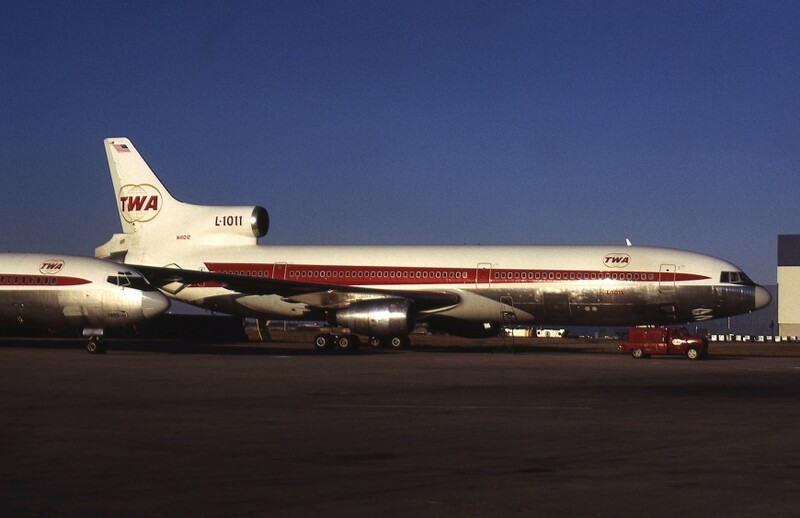 Two L-1011 Las Vegas turnarounds replaced one jumbo and widebody flights to Philadelphia and Boston began. There were some early problems with the L-1011’s Rolls-Royce engines, including an incident when one of the powerplants literally came apart in flight. Not long after we began a San Francisco morning departure from O’Hare, I was assigned to that pairing. We served breakfast and were abeam Kansas City when the captain called me up front to advise that we were losing oil pressure in the No. 3 engine and about to shut it down. I remember him telling the co-pilot to get clearance for descent to 25,000 feet from 33,000. He replied, “they can’t give it to us.” Captain: “Tell them we’ve GOT to have it!” About that time I left the cockpit to give our passengers the bad news. Planning had us fly all the way back to ORD; time in the air was nearly three hours. One lady had a bit of a panic attack after the captain announced that emergency equipment would be standing by on our arrival. It all worked out okay but we canceled on arrival at Chicago. With flights today running at or near capacity, it’s hard to believe we were carrying load factors well under 50% in the 1970s. When the oil crisis in the early part of the decade, schedules were cut substantially and flights still went out with more empty seats than full. 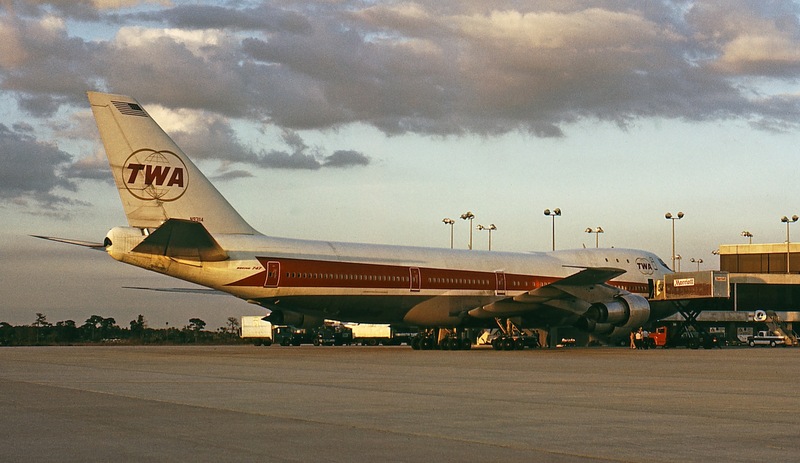 Some 747 domestic trips returned to ORD in September 1972, including the Las Vegas turnaround. Another was Flight 429, a dinner service to Las Vegas, which returned as a red-eye Flight 114. Because of on-duty limitations, the crews could not operate this pairing as a turnaround, resulting in a 30-hour Las Vegas layover. Needless to say it was popular with the cabin crews. I flew the trip for a couple of months and, according to my logbook, we often operated with substituted equipment, usually an L-1011 but occasionally a 707 or even a Convair 880. While the westbound segment carried fair loads, the eastbound return flight was nearly empty most of the time. 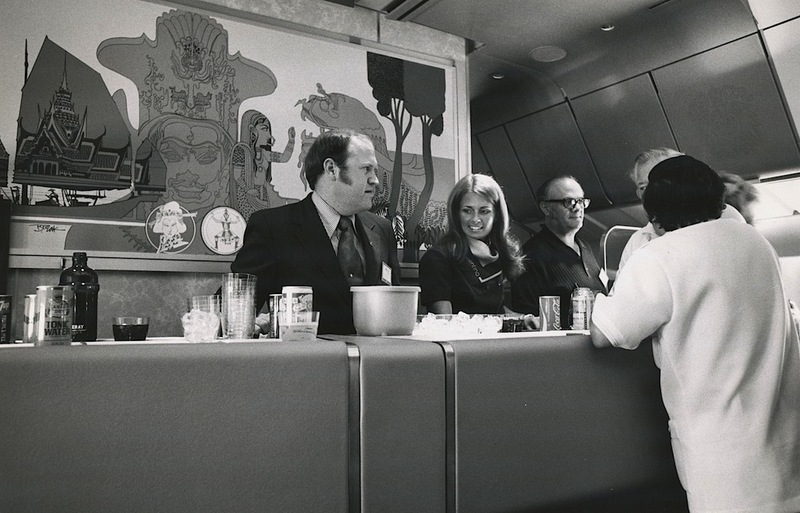 Heading back to Chicago on one of the trips, our 747 carried 6 first-class and 16 coach passengers; staying awake was a challenge for the cabin crew. We also flew some 747 charters later that year, including a series of trips for Massey Ferguson, the agricultural equipment-manufacturing folks who brought their customers to Disney World in Florida. The flights operated into and out of Tampa, probably because it was a TWA station; Orlando didn’t come on line for several more years. The initial flight brought a group in and ferried out empty. Thereafter, each one carried passengers in and picked up the previous ones, taking them home. I worked a couple of these trips; both were memorable, and not just because we had really pleasant passengers. On the evening of December 9, I deadheaded from ORD to Indianapolis in a snowstorm, on an Allegheny Convair 580. The flight was delayed more than two hours but got me to Indy for a short night’s sleep to be in position for our 747 charter the next morning, to Tampa with 330 passengers. We turned around there and brought 220 up to Washington-Dulles, then spent the night. 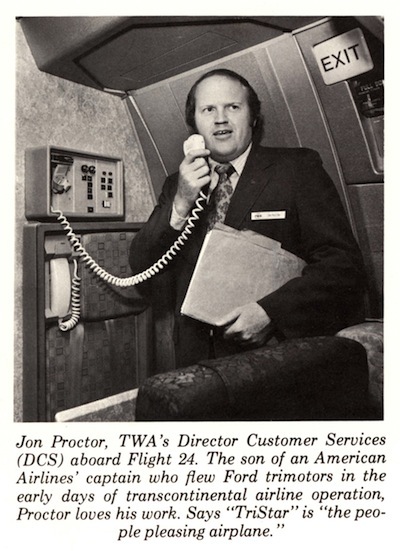 This appeared in the in-house TWA Skyliner newspaper. The next morning, following a short ferry flight up to Philadelphia, a scenic flight was operated on behalf of our sales department to commemorate the opening of the airport’s new runway. 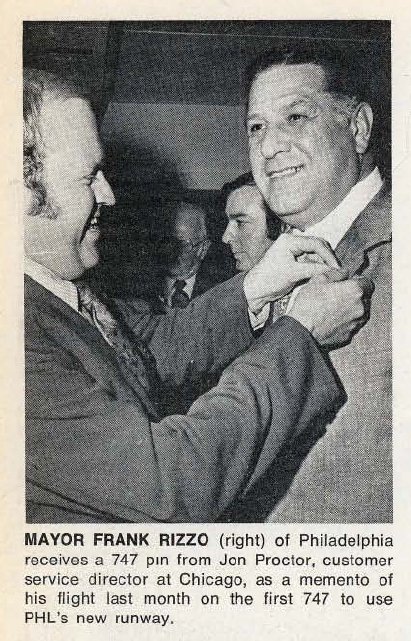 During the 2-hour flight copious amounts of hors d’oeurves and liquor were served to 148 travel agents, corporate customers and dignitaries, including the infamous Mayor Frank Rizzo and his bodyguards. Four days later I deadheaded on Northwest Airlines from Chicago back to Tampa and picked up the last charter in the series the next day, to Montreal. Again, we had a relatively light load, 215 passengers, and brought many of the Massey Ferguson sales people with us. About an hour before our scheduled arrival time, the captain announced that Montreal Airport was temporarily closed due to heavy snow, but they expected to have a runway cleared shortly and we would not be delayed more than 30 minutes. Although a stock photo taken much more recently, this is what it looked like on arrival at Montreal. We landed on a freshly plowed runway and slowly taxied towards what we were told would be a “hard stand” gate with no Jetway; this would be challenging in the middle of a still-raging snowstorm. But fate was on our side when an Air Canada flagger mistakenly directed us into a regular gate. By the time the error was discovered, most of our passengers were inside the terminal and it was too late to stop the deplaning process. I deadheaded to Chicago the next morning on Air Canada. By then the weather had cleared and I enjoyed watching an armada of snow removal equipment filling an endless line of dump trucks as they cleaned up the ramp area and taxiways. The Montreal airport staff certainly knew how to handle heavy snow. 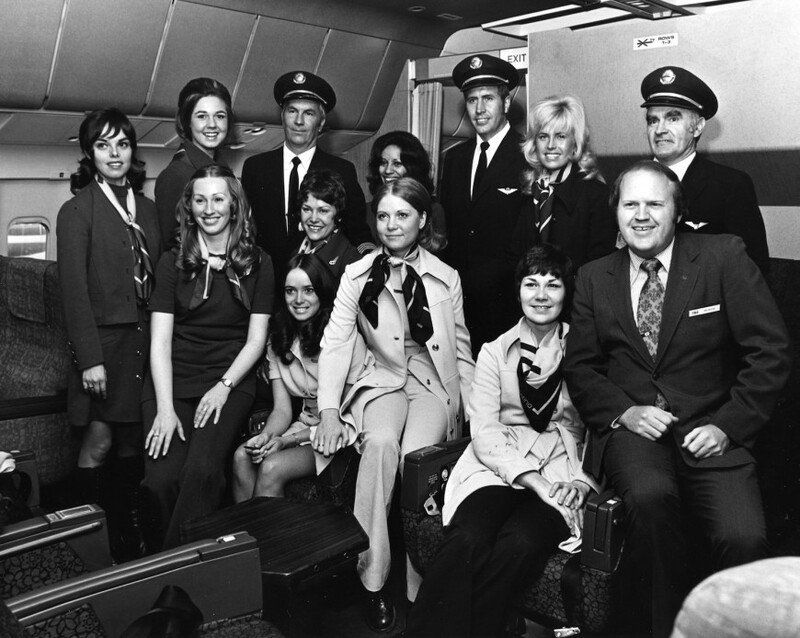 In spring 1973, Los Angeles-based cabin crews began staffing the London flights out of Chicago, part of a six-day marathon pairing: LAX-LHR-ORD-LHR-LAX. A decision was made to assign ORD-based DCSs to the ORD-LHR-ORD segments, for us a welcome break from domestic flying. To say the cabin crews were senior would be an understatement, but with experience came professionalism and they were a joy to work with. In addition, I knew many of them from my earlier days when I was stationed on the West Coast. 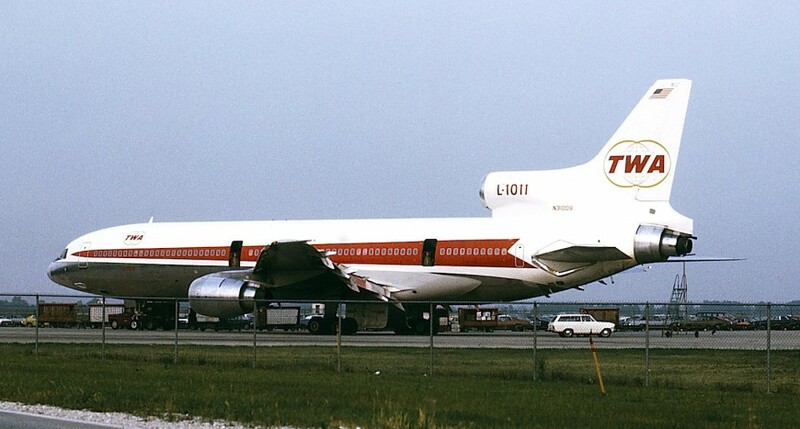 I had the distinction of working the first L-1011 flight to land at Salt Lake City in July 1973, an unplanned event that was not the airplane’s fault. This occurred on the continuation of Flight 771 from London, which operated with a 747 to Chicago, and changed to a TriStar at ORD. A female passenger from LHR had lost her husband to a heart attack in England while on vacation. A doctor prescribed a sedative and she apparently got mixed up on the dosage with the time changes. A flight attendant tried to wake her up for dinner and couldn’t. I could barely find a pulse and paged for a doctor; none were aboard but a nurse answered the call. By then we had located the woman’s prescription bottle from her purse. The nurse told us the woman needed immediately medical attention or she might die. 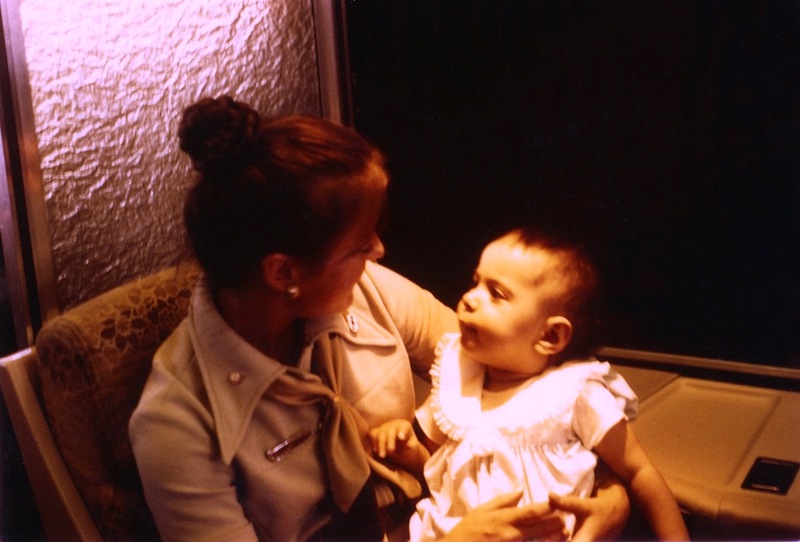 I went to the cockpit and advised the captain, who was not anxious to land at a strange airport (at the time we did not serve SLC) and told me to bring the nurse to the up front. She convinced him and we landed. Western Airlines handled us on the ground, putting steps up to the No. 2 door with engines running and the EMT folks got her off the airplane. Then we had to sit for nearly a half-hour while load control at Kansas City figured the takeoff numbers; there are definite disadvantages to being first to an airport with a new airplane. The woman’s daughter met us in SFO and said her mom was recovering after having her stomach pumped. The doctors said she would not have survived another hour, which was comforting to everyone, especially the nurse that had convinced our captain to divert. On the next trip four of the crew and I hopped a Twin Otter for an outing on Nantucket. 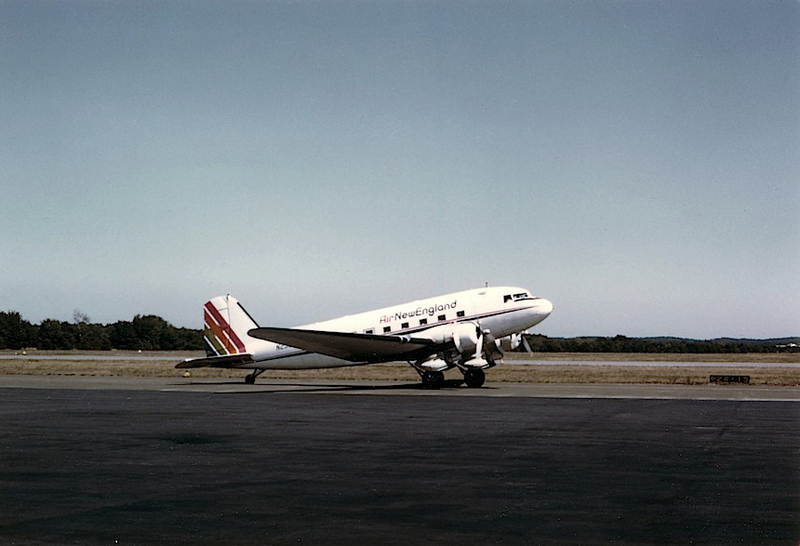 The flight made a stop at Hyannis where we were promptly bumped for revenue passengers. It didn’t look like we would get to our planned destination until a DC-3 was substituted for the next trip to Nantucket and everyone got on. We rented bicycles and toured all around the island, then caught the nonstop Twin Otter flight back to BOS in time for dinner. In October the LAX DCS domicile needed help to cover some vacation time and a temporary staff shortage. Two of us from Chicago were assigned to deadhead to LAX and fly the six-day London trip. Again, Bruce Megenhardt and I volunteered and were given the green light, probably because we had relatives in California who would house us, saving on hotel costs. We would fly to LAX a day early, work the pairing, again spent the night in California and return home, quite an adventure. I got to fly two and one-half of those trips, where we crossed 30 time zones in eight days. 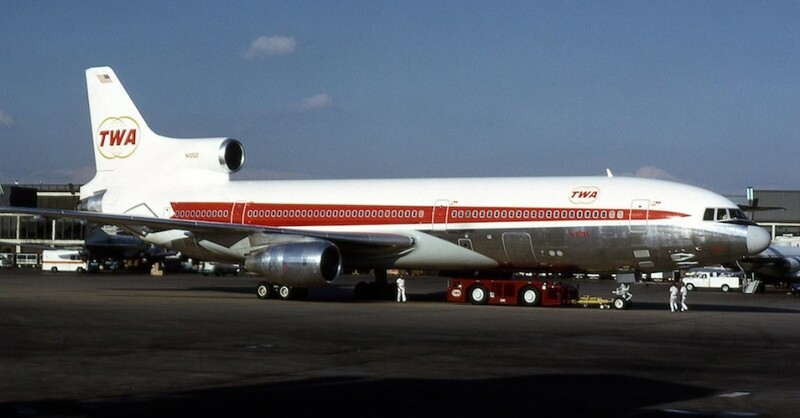 TWA had only 747-100s at the time, which barely completed the nonstop polar flights. On the westbound segments we were routinely cleared to somewhere like Winnipeg or Spokane, subject to re-release depending remaining fuel upon reaching that point. But we made it nonstop despite fairly heavy passenger loads. A nice benefit was the ability to sleep in my own bed in the middle of the pairing and repack clean clothes. 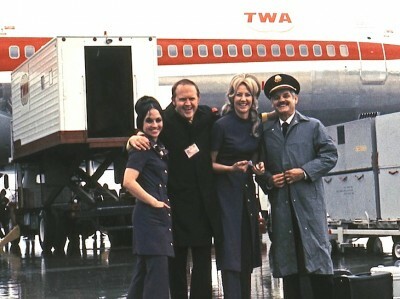 TWA was still carrying more than its share of celebrities, particularly on flights out of Los Angeles. On one of the trips, the entire Osmond family – not just Donnie and Marie – took up nearly all of the first-class section. I had a chance to talk at length with their father, and enjoyed meeting the family. Peter Lawford was aboard on another flight, riding in economy, I might add. On the last trip I was assigned to just the LAX-LHR-ORD portion. 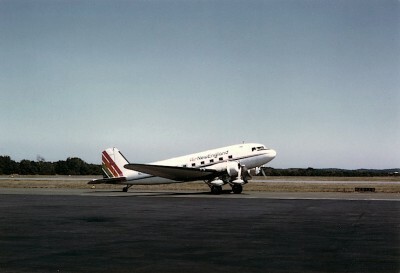 We departed from Los Angeles with only 113 passengers and among them was Dan Haughton, Chairman of the Lockheed Corporation. Again I got the opportunity to chat with a celebrity of sorts. The flight was routine until we approached the Irish Coast and were informed that Heathrow Airport in London was below limits with fog. Having no extra holding fuel, we “landed short,” at Prestwick, to await improvement in the weather. It turned into a long on-duty period after nearly two hours on the ground in Scotland. 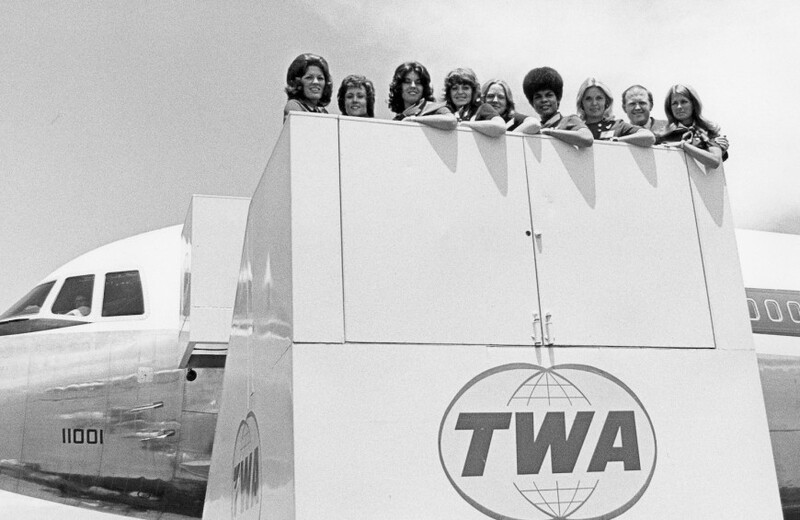 At midnight on November 4, 1973, TWA’s flight attendants went on strike, a work stoppage that lasted 45 days. I was on a layover in Phoenix when it began and got back to O’Hare on two different “sweep” flights dispatched to return crewmembers and a few non-revs back to domicile. The first flight was over to Los Angeles, then a second to Chicago via San Francisco and Kansas City. There was a party-like atmosphere aboard the flights, particularly on the second airplane, until we neared O’Hare and the impact of what had occurred began to hit. A variety of jobs were placed upon the DCS corps to keep us busy, including “guarding” the airplanes at night, in vehicles on the ramp. We were paired up for this exercise, thank goodness, or most of us would have fallen asleep. Fellow DCS Jerry Pearson, also my roommate at the time, shared the duty with me a few times. As I recall, we solved all the problems of the world during those long nights; the two of us remain close friends to this day. See my visit with Jerry and his wife Sharon on my 2012 road trip report. Roy Davis, the legendary director of maintenance at O’Hare, put us to work during the day, cleaning and polishing airplanes under the watchful eye of maintenance foremen. Each morning he stood at the coffee machine in the break room as we filed in, inserting coins to provide us with java. Not being a coffee drinker, I asked if I could have a Diet Coke instead. From then on, I’d hear, “Go get your damn Coke, Proctor!” One day, Roy told us to bring our cars into the hangar and we washed and waxed them instead of airplanes. Moviegoers will remember actor George Kennedy’s portrayal of Joe Patroni in the 1970 film, Airport. The character in Arthur Hailey’s novel came from the author’s exposure to Roy during a book research visit to TWA’s O’Hare operation. Another ORD-based character was Passenger Relations Rep Ginny Henline, who was portrayed in the film by Jean Seberg as Tanya Livingston. In the novel, Hailey actually referred to Ginny as “Jenny Henline,” the only TWAer so identified. In real life, Ginny was as good as they came when handling passengers, having started her career as Ginny Jones at Chicago-Midway Airport. She and Roy were both great to work with. Others in passenger relations were already familiar faces to me. Phil Carlson, Tom Jamison and others were among those who met Flight 771 at ORD Customs when I was flying out of New York. 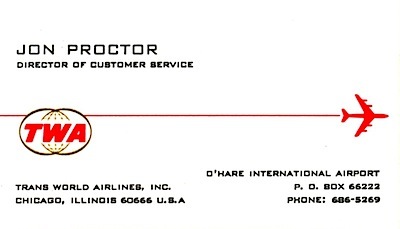 Several O’Hare ground people became DCSs as the ORD base was enlarged. Among them were Harry Barrett, Connie Connell, Tom Donahue, Charlie Stewart and Bob Trotter. 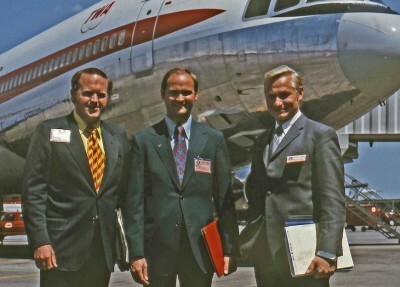 As the strike dragged on, it was decided to check the DCS cadre out on all of TWA’s narrowbody aircraft. An instructor came up from Breech to give us the required classroom time and instead of the obligatory door and exit operations in the training center mockups, we simply climbed on board our idled jets to slam doors and exits. The only problem: we didn’t have a DC-9 at O’Hare, so could not complete the drill for that aircraft type. 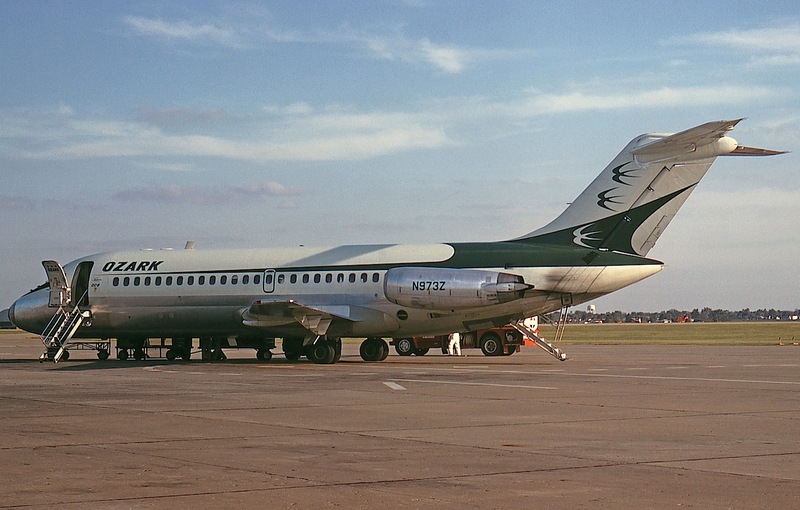 They were going to send us to Kansas City to operate the DC-9 doors but it was going to be difficult getting us there as Ozark and Braniff, which flew the route, were full because of the strike. 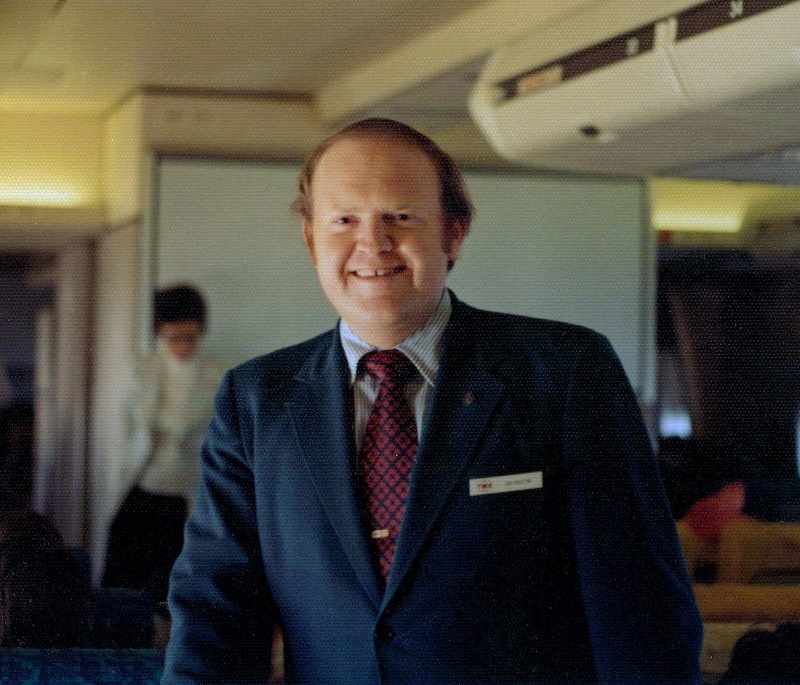 While Ralph Wilson, our boss, was scratching his head, contemplating the logistics of sending 30 or so of us to MCI, I asked him if we couldn’t use someone else’s DC-9 to save the time and agony. I pointed out that Ozark’s hangar was right behind ours and there always seemed to be a DC-9 parked there. The strike was settled just a week before Christmas, hardly enough time to gain back all of our customers for the holiday rush, but it was a welcome relief. We had been working on reduced pay for nearly a month and were happy give those the polishing rags back to Roy Davis. Incidentally, I worked an L-1011 trip out to LAX on Christmas Eve to spend the evening with family, then came back Christmas Day on an afternoon flight back with 11 passengers and 12 crew. The New Year brought with it more L-1011 routes, including a challenging dinner flight between Chicago and Pittsburgh and a daytime layover in San Francisco, out in the morning and back on the overnight trip. Turnarounds to Phoenix brought more variety and the DCS group continued to grow at O’Hare. Friendships were made that last to this day. 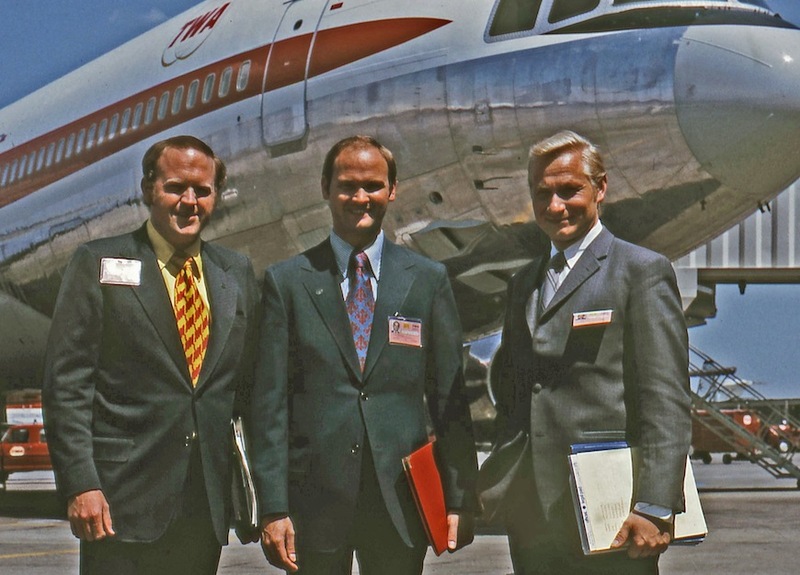 Another life-changing opportunity surfaced as well, in the form of a job opening back at TWA’s corporate headquarters in New York. I applied for the position of Manager – Commissary Programs and, to my surprise, got a job offer. Initially, I was going to turn it down, hating to leave Chicago and a great flying job, but was convinced by my Mike Mudge, who would be my new boss, to take the job. On April 1, 1974, I returned to an office in Manhattan, with new challenges including finding a place to live.